Have you ever gone to some kind of food festival or food bazaar? If you have not, consider it to be one of many festivals you will go this summer. Food festival or food bazaar can be really fun. The chefs participated in the festival get to play around, breathe some fresh air, and get in touch with food connoisseurs. 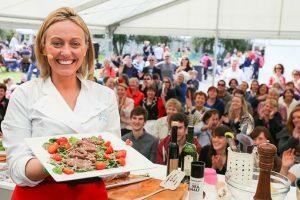 The festival also offers them an opportunity to show off their cooks or restaurants and, hopefully, will leave a good impression on the public so that the public will remember their cooks and come visit their restaurants. Just like any other festivals, food festival or food bazaar will include the common promotional activities. What makes it even more unique and interesting is that they offer equal opportunity to all the brands. Taste of Moscow is the unique event held in Russia that provides both marketing and consumers opportunities for people who run some food business. It does not matter whether you are an artisan producer, a big brand, or a mere consumer; Taste of Moscow will provide you an exceptional platform from which you can interact with fellow chefs and sell 30,000 delicious foodies to consumers. The number of the guests of Taste of Moscow is growing from year to year. If you are new to it, do not worry. In this article, I will disclose to you 9 tasty facts about “Taste of Moscow” you should know. So, keep scrolling! Here is a list of participants whom you will find hanging around Taste of Moscow quite often. Brands’ holders who will represent their best brands, exclusive products, and premium services to establish gastronomic trends to the public. In the Taste of Moscow festival, “taste” is the official currency for payment of meals in restaurants available within the festival. If you want to dine in one of the restaurants, you need to purchase “taste” in Taste banks. It will cost you around 100 Russian rubles per one “taste”. The standard price for meals in restaurants is around 3 to 5 “tastes”. However, please keep in mind that “taste” is non-refundable, so make sure you spend it all once you purchase it. You can spend it on food, drink, or souvenirs. If you fit in to one of these criterion, then Taste of Moscow is place you definitely have to visit this summer. You have an average and high level of income. Taste of Moscow is not only about high-end restaurants, delicious foods, and drinks. It is more like a lifestyle: beautiful things, fashion, accessories, personal care products, fitness, financial and educational services, interesting leisure and travels, and much more. The festival is also held for people whose business has something to do with fashionable clothes, accessories, cosmetics, travel agent, appliances, fitness club, spa, business class housing, insurance services, and many others. Taste of Moscow is an ideal platform for meeting with more than 40,000 visitors who not only want to learn more about your products and services, but also to purchase them. In the Taste of Moscow, there is a culinary show performed by first-class chefs of the best restaurants in Russia and Europe. Within four days, the chefs will share their professional secrets on the open stage in front of hundreds of viewers. Bring your children along if you plan to join in the Taste of Moscow. There is a session made especially for children called Junior Chefs’ Secrets where famous chefs will hold several workshops on cooking delicious and healthy sweets with various fillings and delicious desserts. In the Taste of Moscow, there is a sub-event called Beauty Market that provides the visitors an author’s selection of beauty recipes that will warm or at least make you smile in the mirror. Lipsticks and glitters are one of the main things that a modern woman uses all the time, thus Beauty Market focuses on those. The professional will help you choose them based on your wardrobe, mood, time of year, and day. And for every girl, it is important that they find them tender and tasty. Each shade has the name of a delicious cocktail, with flavors of berries, fruits, and desserts that will lift your spirits. There are more sub-events that hype up the Taste of Moscow festival, such as Chefs’ Secrets which is an interactive platform for those who wish to try themselves as a chef and find themselves in the same kitchen with one of the best representatives of world culinary skills, Wine and Spirits Academy which is the tasting zone for the best wines and spirits, and Pop-Up Restaurant which is a platform for the most sophisticated, their gastronomic sets accompanied by outstanding drinks represented by eminent chefs. Taste of Moscow also holds a rich evening entertainment program and offers you a performance of famous artists. There are also theatrical performances, jazz-lounge, and many surprises for the guests of the festival! So, those are 9 tasty facts about “Taste of Moscow” you should know. Have you included Taste of Moscow in your travel bucket list yet? If you have not, then do it now.